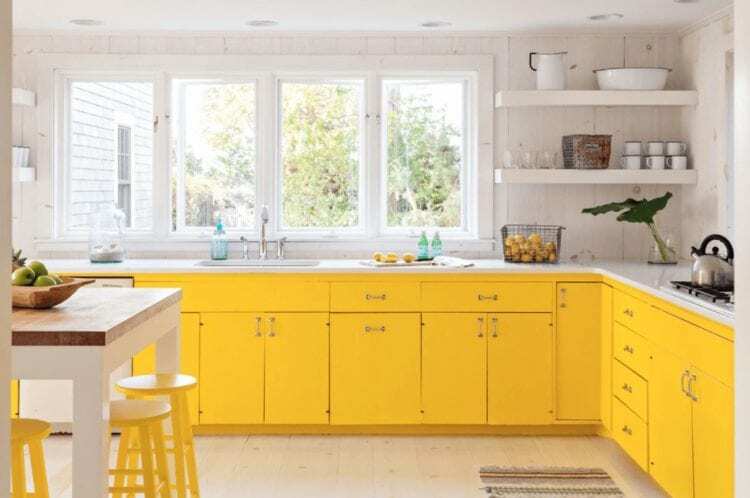 FeastHome – The yellow color kitchen is sunny, radiant, and warm. It’s the happiest and cheerful color you can have in your interior design and decoration. 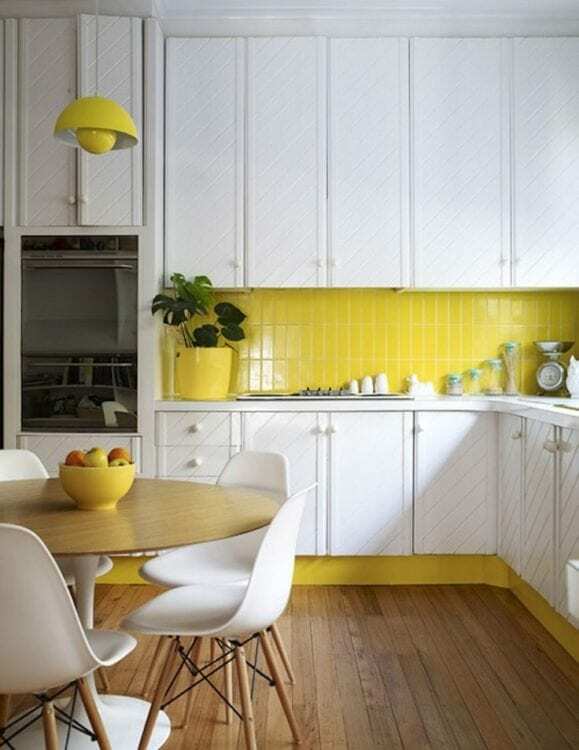 You can use yellow almost everywhere including the kitchen. Yellow is a positive color which offers some energetic and welcoming vibe into the room. It’s one of the best bold colors for your kitchen. It can be used both as an accent color or main color scheme. It depends on the hues. So, here are some yellow color kitchen ideas you need to explore. 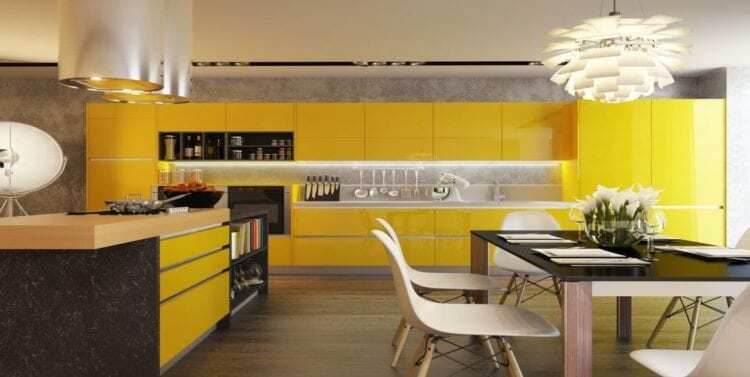 Choosing the color of yellow for a kitchen should be based on the style. There are quite a lot of hue selections when dealing with yellow. You can go with a pastel soft yellow on the traditional kitchen, or you can have it minimalist like this small kitchen with yellow accent. Besides color, the material of the kitchen cabinet is also very important. It could decide the character of the paint color. This kitchen has a narrow walkway and limited space. But, it’s designed that way to support effective and efficient cook flow. Green is one exciting color to be paired with yellow. To incorporate nature and organic sense in your kitchen, you can combine both of them. As you can see, the soft green hue is there to accentuate the yellow kitchen cabinets. It ignites the retro style in this modern kitchen. The great amount of natural grey color is enough to call this kitchen as earthy. The grey base is accentuated with a modern yellow cabinet. It gives some kind of energy in this large kitchen. The wooden flooring completes the essential element of the kitchen. This kitchen looks stunning. Having a cottage style would sometime turn the kitchen into a rustic wood fiesta. In this case, your cottage-style kitchen would be the most fashionable room in your house. The bold yellow color shines outstandingly on a crisp white scheme. 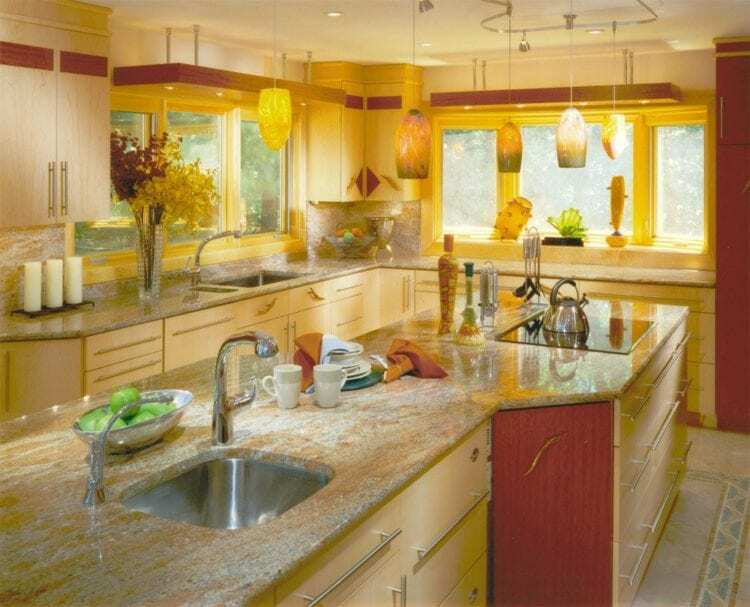 It’s one of the stunning designs of the modern yellow kitchen. The smooth and clean surface with less texture is the key to a stunning designer scheme of a kitchen. 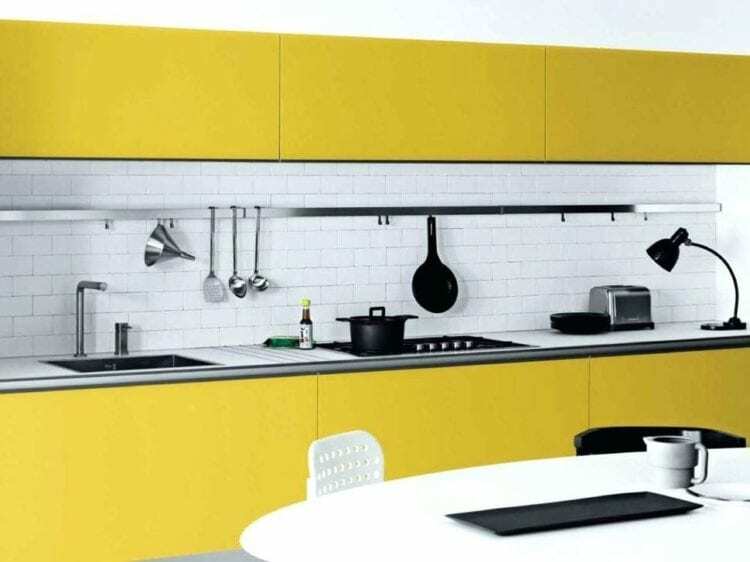 This modern kitchen is filled with yellow color on the cabinets. Homeowners love to have a narrow walkway for their kitchen. It would give easy access and efficient workflow to your cooking because there’s no significant distance across the counter. There’re several ways to incorporate a subway tile into the kitchen. In this kitchen, the tile was installed as the backsplash which most people have in their kitchen. The colored yellow backsplash tile is great for this kitchen since the color has a good match with brown wood. 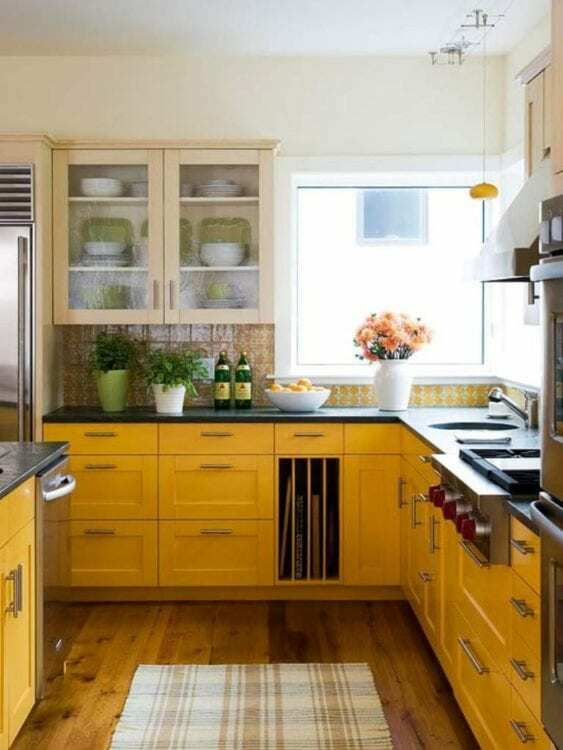 The color of yellow in this kitchen is only used as an additional color. 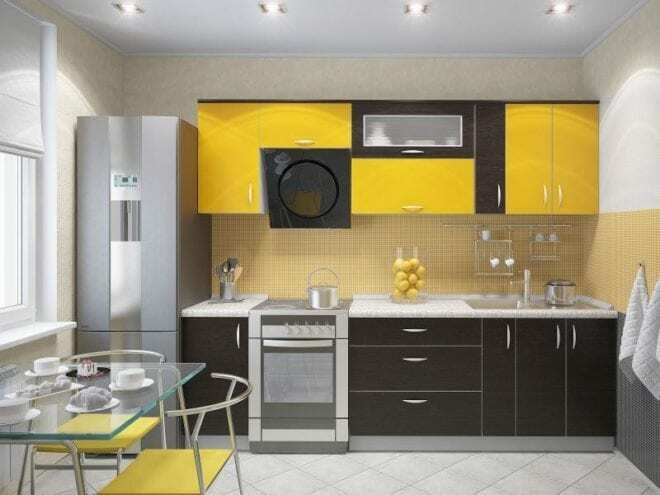 This natural wood kitchen consists of three other colors, black, white, and yellow. That combination makes this narrow space would be as outstanding as it’s expected to be. Even though this kitchen is small and narrow, but it’s got a one wall side full of window glass. It really makes this kitchen more spacious. 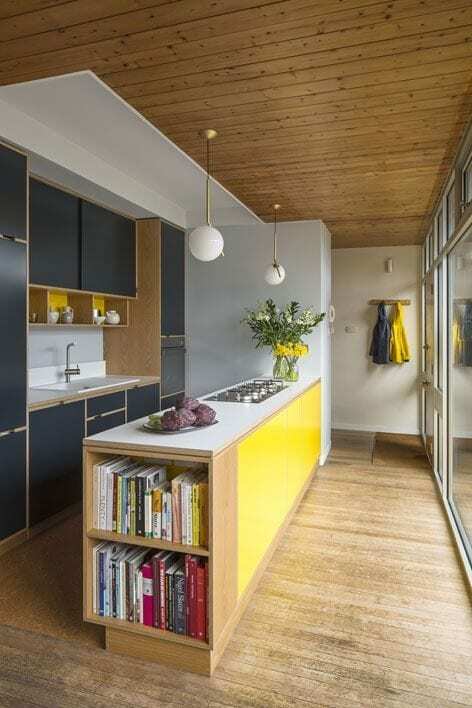 Yellow is the main color of this kitchen’s design scheme. It’s got a softer hue that would bring out the calmness you need when cooking in the night. During the day, the sunlight from the outside would burn the yellow to its maximum charm. Just looking at it blends with the light wood countertop; it would calm you every time. There’s a white tile backsplash installed in the middle to befriend the yellow. In order to have all the things smoothly, picking the right colors that are beneficial to each other is very important. 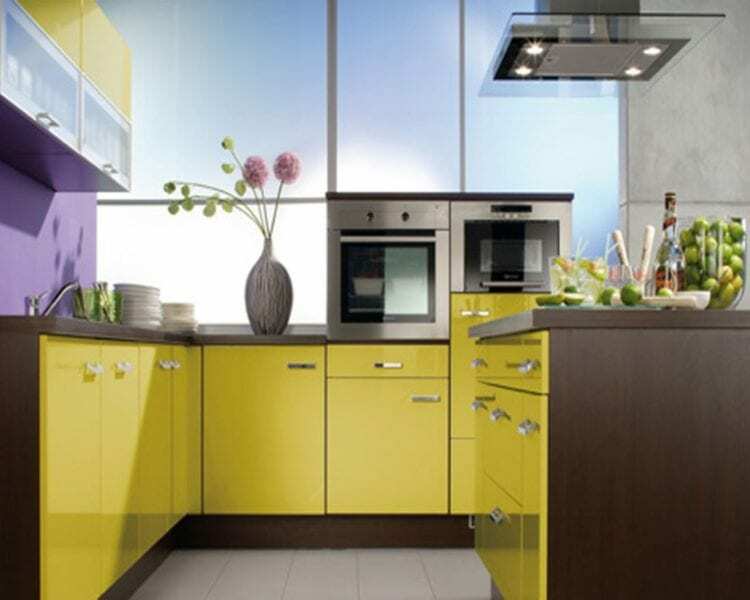 Any shades of yellow you’d like to pick for your kitchen should be matched with the right color. As you can see in the picture, this is what happens when you combine the right colors. The amount of portion for grey and yellow color in this kitchen is well-balanced. That’s what makes this kitchen so beautiful. It’s called sunflower theme because it’s got a color mix that looks like a sunflower. It’s believable when you enter this kitchen, you would feel the hotness and excitement of this colorful design scheme. It’s got several artistic light pendants that make your cooking area so impressive. Actually, the color scheme of the kitchen is not yellow. The light pendants are really responsible for the yellowish accent. It’s another small kitchen with yellow color. Choosing light or bright color for a small room is recommended because it could add more space visually to the narrow or small room. 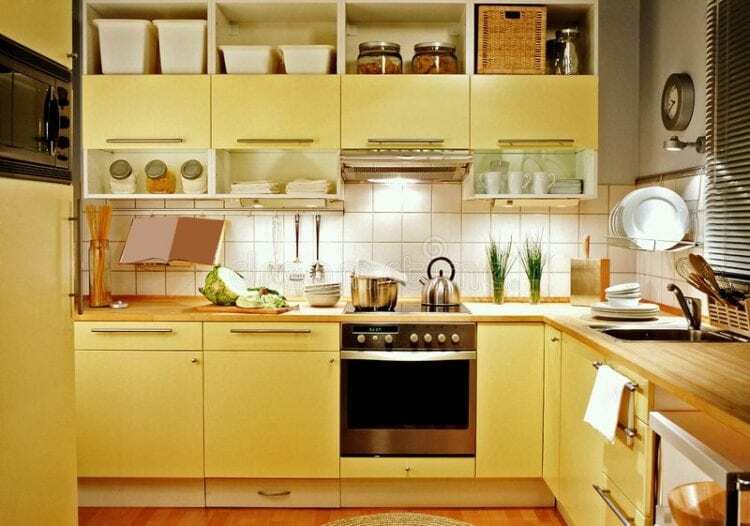 In this case, the light yellow hue is chosen to color the cabinet. Even though the concept of this kitchen is open, you can see the obvious separation between the rooms. It’s because of the color choice. The selection of color paint between the living room and kitchen is completely different. 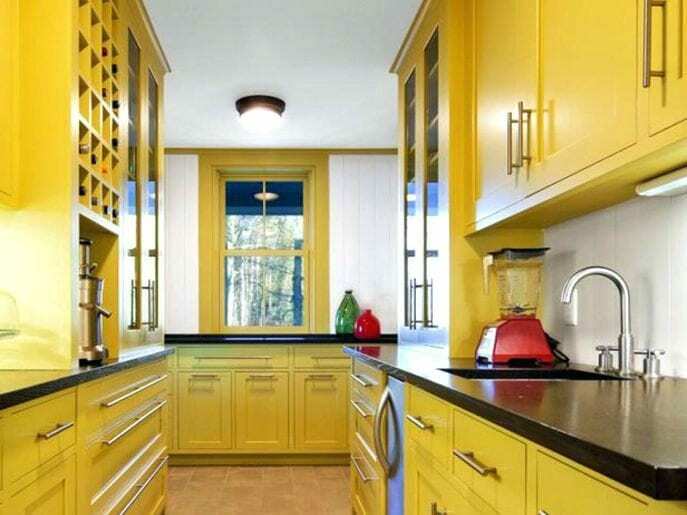 The warm feel is what people want to have when they choose to apply yellow in their kitchen. Yellow would also raise some spirits for you every day. This grayish kitchen is really making a great base to the enriching yellow color. 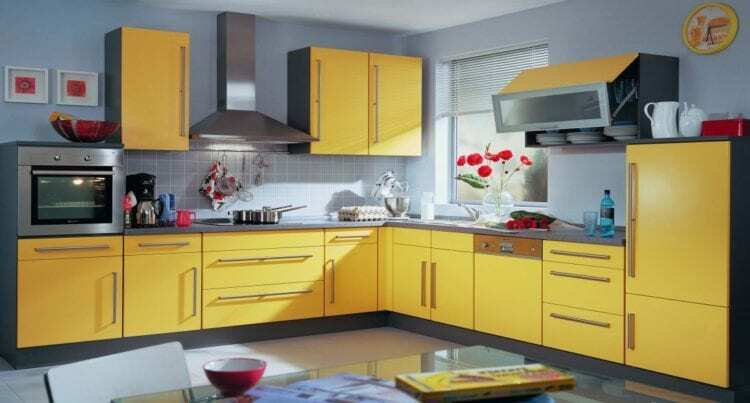 This kitchen got yellow color applied on cabinet doors and drawers. The sweet combination of dark brown and yellow is something else. This is a sweet touch to incorporate into your cooking flow. 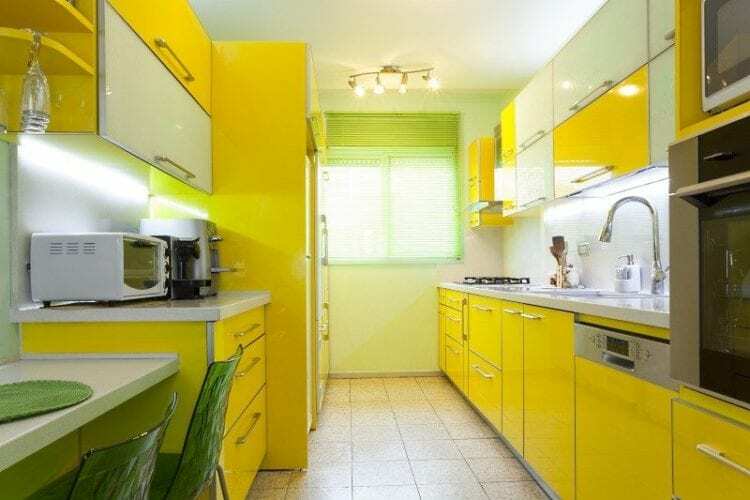 It’s clear that the color scheme of this kitchen is white and yellow. They always blend well together and beneficial to each other. The addition of black kitchenware is just the right thing you need to do to this kitchen. To conclude, the selection of yellow color hues is not so wide. You just have to be creative in combining it with other colors. 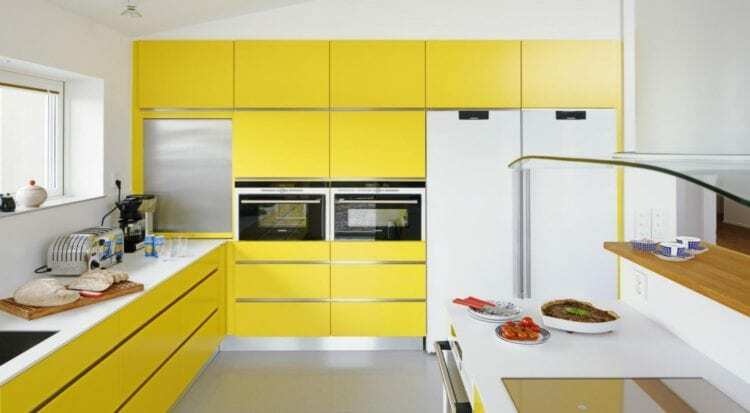 Those 17 yellow color kitchen ideas will surely help to guide you.